FILE - An Afghan National Army (ANA) soldier stands guard in Narai military camp in Ghazi Abad district, Feb. 23, 2014. Loyalists of Islamic State (IS) in Afghanistan released a new video Friday showing a massive suicide car bombing of an Afghan security outpost and several other violent acts elsewhere, including some carried out in neighboring Pakistan. The purported IS video released to reporters, titled “Khurasan, The Graveyard of Murtadeen (apostates),” shows footage of militants ambushing a convoy of Pakistani security forces traveling through a mountainous terrain, firefights with security forces elsewhere, and two roadside bombs blowing up Afghan government vehicles, according to the Pashto language subtitling. A man is beheaded and two others are shot at close range in the back of the head. It said the violent acts were being conducted in eastern Afghan provinces Logar, Nangarhar and Paktika, near the border with Pakistan. Toward the end, the video shows a man saying goodbye to fellow militants before boarding an explosives-laden vehicle and driving it into an Afghan National Army outpost. A massive explosion sends a huge smoke cloud in the air, apparently destroying the entire facility in the district of Azra in Logar. The authenticity of the video and the dates the violence took place could not be immediately verified. Islamic State, which controls large areas in Iraq and Syria, released a map in January that identified Khurasan as its “province,” which includes areas of Afghanistan and Pakistan. The video also shows footage of two separate attacks against security forces and pro-government tribal leaders in Pakistan’s semi-autonomous districts of Bajaur and Khyber, bordering Afghanistan. It also claimed responsibility for being behind the attack on a bus in Karachi in May in which gunmen massacred 43 members of the minority Shi’ite Ismaili community. 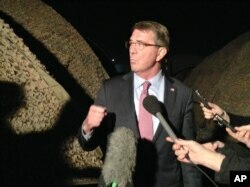 During his visit to Afghanistan last week, U.S. Defense Secretary Ash Carter underscored the emerging new threat in the region, saying the U.S. military possessed information suggesting that IS was seeking an opportunity to establish “nests” in parts of the strife-torn country, including Nangarhar. On Thursday, authorities in the eastern Afghan province claimed to have blocked broadcasts of the so-called "Sadai Khilafat Radio (Voice of Caliphate)," which was airing pro-IS propaganda. The radio station was recently launched from an unknown location, broadcasting at least one hour a day to attract young Afghan men disenchanted by dim job prospects. In a statement released Friday, the Taliban rejected media reports it has held talks or sought Russian cooperation in fighting supporters of Islamic State in Afghanistan. It claimed the Taliban is capable of handling the threat and has eliminated IS fighters from all 34 provinces of Afghanistan. It said they are now confined to just “a small” area in one province. The statement did not name the province, but Afghan officials said that eastern Nangarhar province, on the border with Pakistan, is where IS has established a strong base. Earlier this week, Russia’s presidential envoy for Afghanistan, Zamir Kabulov, told the Interfax news agency that Moscow’s interests in Afghanistan “objectively coincide” with those of the Taliban movement in the fight against IS. Kabulov said Russia has established communication channels to exchange information with the Taliban.